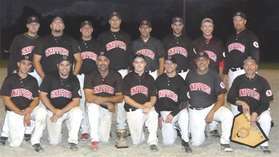 The Niagara Snappers outlasted the Niagara Fury 11-8 to capture the 2012 Niagara Falls Men’s League championship. A total of 7 home runs were hit in the game as both teams combined for 19 runs and 25 hits. The Fury jumped on the board in the top of the 2nd inning with a couple of walks having been issued by Snapper starter Matt Lyon. Marcel Bilodeau singled in the game’s first run with Phil John and Rob Greatrix also picking up RBI’s to make it 3-0 Fury. The Fury would add to their lead in the top of the 3rd with a solo home run by Tom Watkinson. In the bottom of the 3rd, with the Snappers down 4-0, Alex Szockyj and Ryan Rothwell reached and Alex Panas laid down a sacrifice bunt to move both runners into scoring position. Peter Dobbin then singled in both runs to close the gap to 4-2 after 3 complete innings. In the top of the 4th, the Fury struck hard at starter Lyon, scoring 4 runs to break the game open with home runs by Mark Korten and Ray Carr, Korten’s home run being a 3 run shot, to increase the score to 8-2. The Snappers began chipping away at the lead in the bottom of the 4th with Lyon hitting a solo shot, followed by Scott Young also hitting a bases empty home run to narrow the gap to 8-4. Kevin Newhouse singled and scored on a Ryan Rothwell triple to bring the score to 8-5 after 4 innings. Perry Bartley came into the game to relieve Matt Lyon and had a 1-2-3 top of the 5th inning. Going into the bottom of the 5th, the Snappers even the score with a Scott Young double that scored 2 runs and a Szockyj double that plated Young. Bartley again was working the rise and change in the top of the 6th to get out of the inning with only a single allowed to Adam Dearborn. Mike Bateman put the Snappers on top for the first time in the game with a solo home run to lead off the bottom of the 6th inning with Matt Lyon adding a 2 run home run to good measure to make the score 11-8 going into the final frame. Bartley closed out the top of the 7th to pick up the win in relief of Matt Lyon, with Butch Provost taking the loss for the Fury. Both teams competed hard all night, as they have done every time they step on the field together. The win leaves the Snappers with a 42-12 overall record for the 2012 season, GHFL regular season champions, GHFL playoff tournament champions, NFMFL playoff champions, Woodstock tournament winners, as well as a tied for 9th place finish at the ISC World Tournament. The Niagara Snappers open the scoring in the top of the 3rd inning with a double by Mike Bateman to cash Perry Bartley. Jason Paylove enters the game to pinch run for Bateman and reaches 3rd on a pass ball. Matt Lyon hits a hard shot to the 3rd baseman who throws to first to make the out, the Tazco 1st baseman then attempts to throw Paylove out at 3rd base and the ball scoots away allowing the run to score. Tazco gets one back in the bottom of the 3rd inning on a solo home run by Tom Berube. Score after 3 complete innings is 2-1 in favour of the Snappers. In the 4th inning, the Snappers add 3 more to the board when Peter Dobbin hits a hard single to cash in Scott Young who had reached on a walk. Perry Bartley then follows with a single of his own to plate Brent Thompson, who also reached on a walk, and Dobbin. Score after 4 complete innings is Snappers up 5-1. In the 6th inning, the Snappers add another run with a Brent Thompson single followed by Alex Szockyj with a pinch hit RBI double. Snappers lead 6-1 going to the bottom of the inning. Tazco rallies with 3 runs off Snappers reliever Perry Bartley. Rick Kinzel hits a bases clearing double to pull Tazco to within 2 runs. 7th inning sees the Snappers plate another run as Kevin Newhouse leads off the inning with a double. He advances to 3rd on a pass ball and scores on Ryan Rothwell’s sacrifice fly. Snappers go up 7-4. With one more kick at the can in the bottom of the 7th, Tazco leadoff stick Tom Berube doubles and is followed by Aaron Belding who hits a 2 run home run to make the score 7-6. Jason Paylove enters the game and sets the next 3 Tazco hitters down in order to pick up the save as the Snappers move on to the Niagara Falls Men’s Fastball League finals against the Fury. Game #1 will take place on Wednesday September 19th at 7:00pm at Ker Park in Niagara Falls. The Niagara Snappers went into the 2012 GHFL Tournament with the #1 seed and didn't disappoint, winning all 4 of their games to capture the 2012 crown. Led by GHFL Playoff Tournament MVP Andrew Phibbs, the Snappers beat Hill United on Saturday and then rattled off 3 wins on Sunday, downing Tazco, Mississauga Arrows and the Waterdown Hammer in the final. 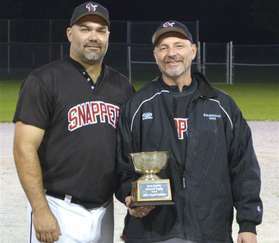 The Snappers last won the GHFL tournament in 2008 with a 1-0 win over the Niagara Falls Dawgs. Since then, the Waterdown Hammer have won twice, and the Mississauga Arrows have won once. Phibbs was a no brainer for the MVP award as he threw 24 innings, allowing only 2 runs while striking out 48. For the year, Phibbs finishes with a 23-5 record, throwing 176 innings, striking out 279 with an ERA of 2.55 and a WHIP of 1.00. Game #1 saw the Snappers match up against Hill United. Alex Panas led the way with a 2-3 game as 7 Snapper players recorded hits in a 5-1 victory. Phibbs pitches 5 scoreless innings striking out 13, including 10 in a row at one point, to pick up the win. Game #2 was a rematch of last years finals as the Snappers cruised to a 6-0 win over the Mississauga Arrows. Arrows starter, and GHFL MVP Pitcher, Andrew Putnam was knocked out of the game after 2 innings as the Snapper offense put 3 runs up on the board early. Mike Bateman let the offense with a solo home run while Scott Young picked up a 2 hits and an RBI. Matt Lyon drove in 2 runs as well. Phibbs pitched 5 innings, allowing only 1 run and striking out 9 to pick up the win. Game #3 was a matchup with long time rivals, Niagara Falls Tazco. The Snappers slipped by with a 2-1 win. Snappers jump on the board early with a solo home run by Matt Lyon in the top of the first inning, Tazco evens the score in the top of the 6th. That sets up Peter Dobbin leading off the bottom of the 6th inning with a single. Dobbin is then pushed to 2nd base with a SAC bunt by Lyon. Mike Bateman cashes Dobbin with a single to make it 2-1. Phibbs shuts the door in the top of the 7th to pick up the win giving up 4 hits, while striking out 15 over 7 innings. With the win, the Snappers moved right to the final game where they matched up against the Waterdown Hammer who were playing their 5th game of the day after losing their 1st game of the tournament and having to come through the losers bracket. Hammer jumps out to a 1-0 lead in the 3rd inning, Snappers answer back in the 4th with a solo home run by Trevor Falk. No scoring until the bottom of the 5th with a pinch runner Jason Paylove in the game on 1st base for Dan Bernard who reached on a hit by pitch. Paylove advances to 2nd on a pass ball and scores on Peter Dobbins line drive up the middle. Phibbs again shuts the door in the door finishing the game giving up only 2 hits over 7 innings while striking out 11. The Niagara Snappers have now won the GHFL playoff tournament in 2005, 2006, 2008,and 2012 while appearing in the finals in 2004, 2007, 2010 and 2011. The Snappers will finish out their 2012 season with game #2 in the 2nd round of the Niagara Falls Men's Fastball League playoffs against Tazco. The Snappers currently lead the best of 3 series 1 game to none. Game #2 takes place on Thursday September 13th at 7:30pm at Ker Park. The winner of this series will take on either CanAm or the Niagara Falls Fury in the finals. The Fury lead that series 1-0. The Niagara Snappers swept their first round of the Niagara Falls League Playoffs with a 8-2 win over the Dawgs. The Snappers took advantage of 8 walks issued in the game with every player on the Niagara roster reaching base by hit or walk. Niagara jumped out to a 6-0 lead after 1 inning and put it in cruise control for the rest of the game. The Dawgs put 2 on the board in the 5th inning when Jordan Bilodeau hit a 2 run home run to right field. Snappers starter Perry Bartley picked up the win with 5 innings of work, striking out 9 while allowing on 5 hits. The Snappers will await the Tazco-Jordan series to conclude in order to find out who their round 2 opponent will be. Dawgs put 1 on the board in the top of the 1st inning when Jordan Lewis singled in Steve Luscombe. Snappers respond with 2 in bottom of the first, Dobbin singles Scott Young homers. Bottom of 4th Ryan Rothwell doubles, Dan Bernard triples to cash him. Bottom of the 5th, Snappers plate 3 with Peter Dobbin tripling to lead off the inning. Perry Bartley and Scott Young both walked. Dobbin scored on a pass ball and Kevin Newhouse doubled in Bartley and Young. Dawgs scored 1 in the top of the 6th but the Snappers finished it off in the bottom half of the frame by putting up 4 more runs to mercy. Scott Young capped off the night with a 3 run home run. 3 Niagara Snappers were chosen to the 2012 ISC All World Team. Pitcher Andrew Phibbs, infielder Mike Bateman, and outfieler Darren Newson all were named after the championship game on Saturday. Phibbs carried the load on the mound for the Snappers, pitching all 48 innings that the team played over 6 days. In the opening game of the tournament, he threw a perfect game with 18 strikeouts and followed that up with another 18 stikeout game a couple of days later. In total, Phibbs ended the tournament with 74 stirkeouts over those 48 innings, a 5-2 record and an ERA of 3.94. Bateman reached base safely in all 7 Snapper games, hitting .529 with an unbelievable .765 on base average over those 7 starts. Chipping in with a home run and 4 RBI's, Bateman was the table setter to the Snappers offense and lent a steady defensive presence at first base. Newson, in his first year with the Snappers, was a juggernaut at the plate, with a .350 average, 1 double, 3 triples, a home run and 7 RBI's in 7 games. Newson also showed a a strong arm and great range in left field. Honorable mention goes to catcher Adam Dearborn who had a very strong tournament both behind the plate and with the bat. Dearborn caught all 48 innings that Phibbs threw and chipped in with a .313 average to go along with a .500 on base average. He led the team with 3 home runs and 8 RBI's. 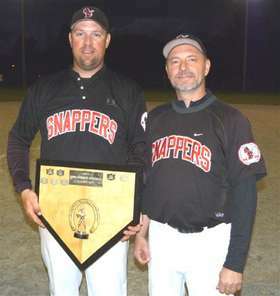 The Niagara Snappers finished 11th in the annual ISC World Fastball Tournament held in Midland, MI. The Snappers, ranked 17th going into the tournament, cruised to a 6-0 win in their opening game and then ran into #4 ranked Pennsylvania Power and fell 6-3 to put them into the losers bracket of the tournament. Niagara went on a 4 game winning streak beating teams ranked 22nd, 20th, 12th and 9th in the world. Entering their 7th game in 6 days, Snappers starting pitcher Andrew Phibbs who had earlier thrown a perfect game with 17 strikeouts along with a game in which he had 18 strikeouts, finally showed a chink in the armour as Niagara lost in a slug fest to the Toronto Gators 12-9. Phibbs finished the tournament throwing all 48 innings that Niagara played, and striking out 74 along the way. The Snappers return home to open up the Niagara Falls League Playoffs against the Niagara Falls Dawgs. Game #1 will be played at 6:45pm at Ker Park in Niagara Falls on Monday August 20th. Game #2 will go at 8:45pm on Wednesday August 22nd at Ker Park. The Niagara Snappers saw their amazing run at the 2012 ISC World Tournament come to an end with a 12-9 loss to the Toronto Gators. The Snappers finish the tournament with a 5-2 record and what is believed to be a 11th place finish. More details to follow. UPDATE: Andrew Phibbs, who pitched every inning of every game this week for the Niagara Snappers, pitched the complete game giving up 12 runs on 15 hits with 6 strikeouts and 3 walks. Phibbs gave everything that he had all week but the Gators offence was just too much. The Snappers were led at the plate by Adam Dearborn who went 2-4 with a home run and 4 RBI's. Mike Bateman also picked up a couple of hits with a home run and 2 RBI's. Matt Lyon went 3-4 with an RBI. Scott Young chipped in with a pair of singles and Peter Dobbin and Darren Newson also collected hits. The Niagara Snappers (ranked #17) pulled off another upset at the 2012 ISC World Tournament by beating the host team Midland Explorers (ranked #9) by a 2-1 score. The win assures the Snappers of a top 10 finish in the tournament. Darren Newson continued his hot streak at the plate by driving in both runs with a triple after the Midland pitcher walked 2 in the inning. Brian Crawford chipped in with a pair of hits. Andrew Phibbs once again was a leader on the mound for the Snappers overcoming an error filled first inning by the Snappers defence to pick up the win. Phibbs has pitched every inning for the Snappers in the tournament so far and will look to continue that trend as Niagara will take on the Toronto Gators (ranked #19) on Thursday August 16th at 10am. The Gators upset Circle Tap earlier in the tournament before losing to the PA Power and then picking up the win against the Seattle Builders. The Niagara Snappers (ranked #17) scored a big 5-3 win over Vancouver, WA Columbia Rockers A-1 Brewers (ranked #12) to move on in the ISC World Tournament. The Snappers record now stands at 4 wins and 1 loss. The Niagara Snappers (ranked #17) took on the Pueblo Bandits (ranked #22) in their fourth game at the 2012 ISC World Tournament and came away with a 5-4 late inning win. Game details are still pending but reports say that with the Snappers down 4-3 late in the game, left fielder Darren Newson smacked a 2 run home run to put Niagara in the lead for good. UPDATE: Darren Newson led the offense going 2-2 with 4 RBI's with a triple and a home run. Mike Bateman continued his hot streak at the plate going 1-1 with 2 walks. Bateman has now hit safely in every game during the World Tournament. The Snappers work Pueblo pitcher Max Montero for 9 walks over the course of the contest. Snappers now move on to face Vancouver, WA Columbia River Rockers (ranked #12) at 3pm on Tuesday August 14th. The Niagara Snappers (ranked #17) staved off relegation to the ISC II portion of the world Tournament with a come from behind 2-1 win over the Aurora, IL Dolan and Murphy (ranked #20). Andrew Phibbs was once again solid on the mound picking up the win scattering 6 hits over 7 innings while striking out 11. The offence was supplied by the long ball once again as Trevor Falk and Kevn Newhouse both hit solo shots, Falks to tie the game, Newhouse's to go ahead in the 6th inning. Mike Bateman continued to be a consistent presence at the plate picking up another hit while Dean Carr made his first world tournament appearance and chipped in with a hit of his own. The Snappers will now move on to play at 7pm against either the Pueblo Bandits (ranked #10) or the Quad City Sox (ranked #14) at 7pm on Monday August 13th. The Niagara Snappers opened up the 2012 ISC World Tournament with a convincing 6-0 win over the Wisconsin Bar on the Avenue Buzz. The story of the game was pitcher Andrew Phibbs as he threw a perfect game with 18 strikeouts. The offence was led by Peter Dobbin, Adam Dearborn and Kevin Newhouse who all hit home runs. Mike Bateman had a perfect day at the plate with 2 hits, a walk and 2 RBI's. Darren Newson and Brian Crawford each picked up a hit as well. Game summary is in the link below. The 2nd game of the ISC World Tournament pitted the #17 ranked Snappers against the #8 ranked Pennsylvania Power. The Power jumped all over Phibbs and staked themselves to a 3-0 led after 2 innings and eventually cruised to a 6-2 victory. Phibbs took the loss giving up 16 hits over 7 innings while walking 7. Lucas Mata of the Power allowed both runs to the Snappers while holding them down to 3 hits to go along with 15 strike outs. Adam Dearborn once again showed why he is hitting in the #4 spot in the lineup as he blasted a 2 run home run in the 6th inning to pull the Snappers to within 2 runs at the time but the Power got both those runs back in the top half of the 7th to cement the victory. Mike Bateman and Brian Crawford collected the other hits for Niagara. Game summary is in the link below. Next up for the Snappers will be a game against the Aurora, IL Dolan and Murphy Shamrocks at 11am on Monday August 13th. #20 ranked Aurora will pose a tough test for the Snappers as they will likely send Czech native Ales Jetmar to the mound. Phibbs is expected to get the ball for Niagara once again. 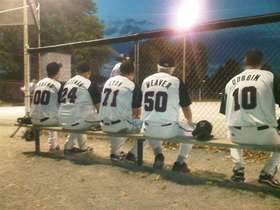 The Niagara Snappers will enter the 2012 Niagara Falls League Playoffs as the #2 seed with a 12-5 record. Their first round opponent will be the Niagara Falls Dawgs. Playoff details are below. The Niagara Snappers, out of Niagara Falls, ON will once again be attempting to qualify for the games pinnacle event. With the ISC World Tournament returning to Midland's Currie Stadium, the Snappers will also be looking at making the return trip to a place where they spent six disappointing days and nights in 2010 trying to find their game and their winning ways. As they stumbled through a 2-4 record and a true sense of underachieving, the Snappers will be setting their sights first on the ISC Qualifier being held in Niagara Falls, ON the third week in June and then hopefully on Midland, MI come mid August. If Niagara is able to qualify in 2012, it will mark the teams 3rd ISC WT appearance in the past five seasons.